Having spotted golden eagles in an area of Mull the previous year, I returned one grey day in the hope of seeing them again. We had parked high on a hillside, with a glorious view, and had been photographing a buzzard when I spotted something further along the hill, soaring on the breeze. 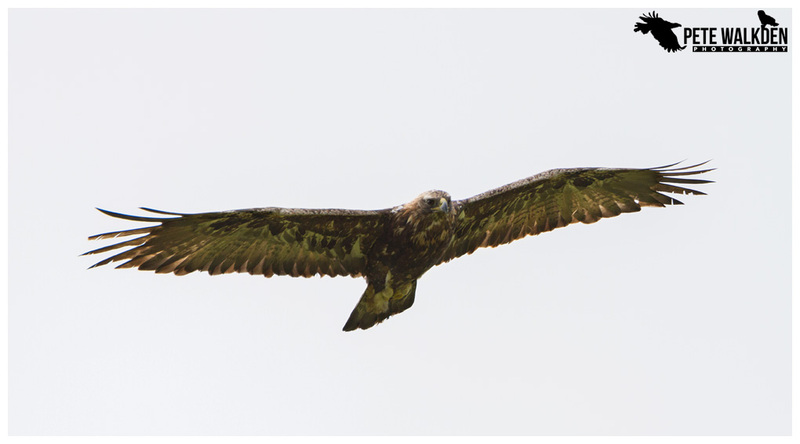 The golden eagle was using the on-shore breeze to hang in the air, whilst scanning the ground for prey. Dad and I watched it with interest until it stooped into a dive, and was lost from view. It was then that I chose to employ the "5 more minutes" rule and it paid off. A moment later, the eagle appeared once more, and glided along above the road, towards where we were standing. It was quite a special feeling when it flew right over us, too close for me to fit both wings in the shot (Canon 50D, 500mm, 1.4TC) before it caught a thermal, and soaring high into the clouds. Needless to say, as it passed over, I was taking masses of images, but I didn't hear Dad taking any... he hadn't. With bad luck to rival that he used to see when we played snooker, his battery had run out just as the eagle approached! Ever since, I've made a mental note to remind him to check the battery each time we're out, so history doesn't repeat itself. Was such a thing possible, and I could have the same experience again, I think I might have increased the shutter speed a tad for the shots, to minimise any blurring, as the shots were only at 1/800th, which was risky with hand-holding 700mm of reach. Still, I came away with some decent images, and a memory to treasure forever.